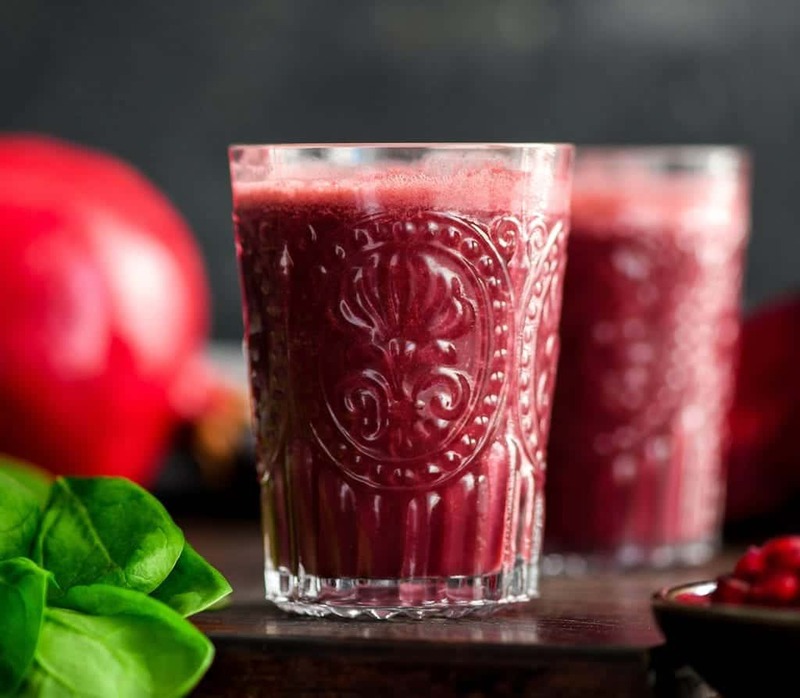 This Beet & Pomegranate Smoothie with spinach is a beautiful and healthy breakfast recipe that utilizes the best winter produce! It’s paleo, & vegan with no refined sugar! I am totally into special occasion breakfasts. I love a pile of french toast or a giant cinnamon roll as much as the next person. However, the number of special celebratory days in December can get a little out of hand. There are tree lightings, visits with Santa and holiday parties etc. etc. 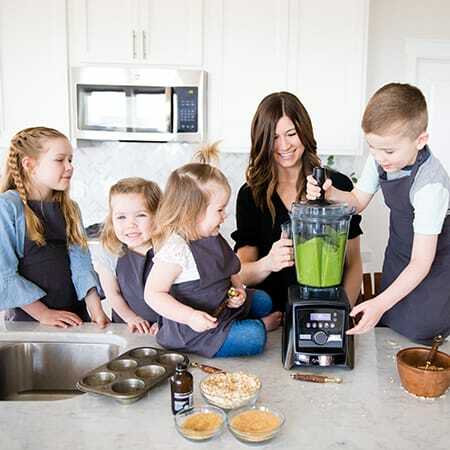 This recipe is literally as easy as putting all your ingredients in your blender and turning it on! Nothing fancy and it takes like 3 minutes to make! As always, I recommend using a Vitamix to make this beauty. Here are are few possible substitutions that could be made to this recipe! Thankfully smoothies are always so customizable! Almond milk. My milk of choice when it comes to smoothie making is always unsweetened vanilla almond milk. You can literally substitute any milk of choice in this recipe and it’ll still turn out fantastic! Just be sure to choose an option that complies with your dietary needs. Honey. If you like your smoothies a bit more tart you can absolutely omit the honey. I have found that in order for my kids to love smoothies I need to add at least 1 TBS of honey. Feel free to use maple syrup to keep it vegan! Spinach. Any leafy greens work well in this recipe! I suggest spinach if you want them to be undetectable! 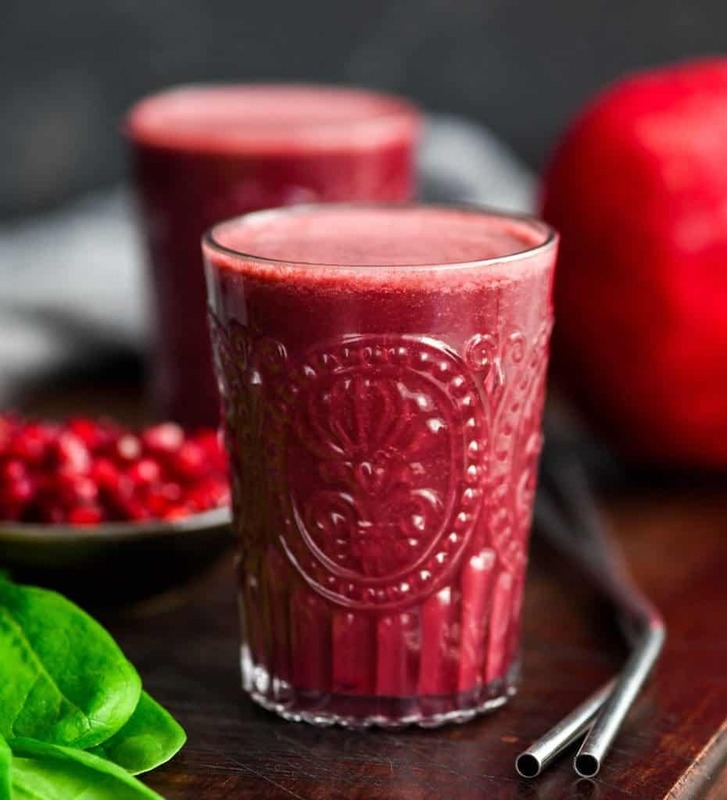 This Beet & Pomegranate Smoothie with spinach is a beautiful and healthy breakfast recipe that utilizes the best winter produce! It's paleo, & vegan with no refined sugar! 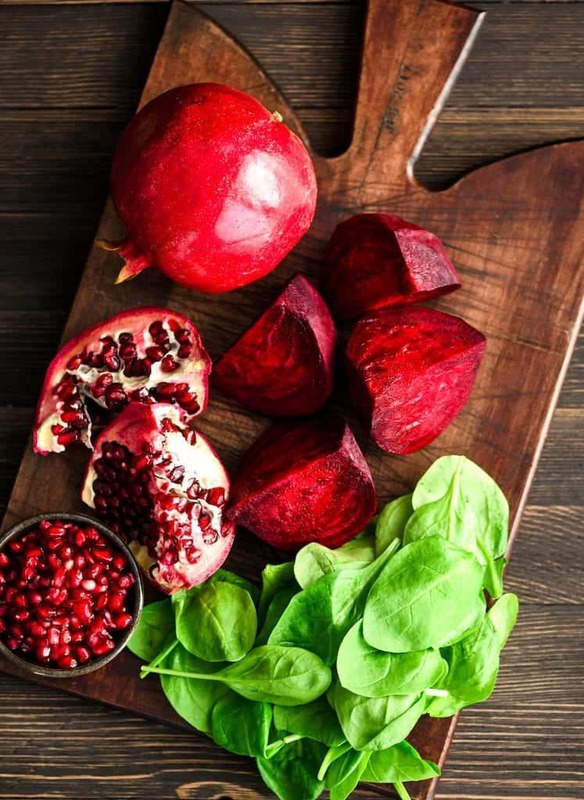 Place all ingredients into the container of your Vitamix (or other high-powered blender). Blend starting on low speed and increasing to high for 60-90 seconds or until smooth. I just love smoothies ALL year long. Especially with beets! The color of this is so pretty and festive – so perfect for December if you ask me! I love smoothies and think they should be enjoyed year round! I have everything I need to make this and am trying it — that color is gorgeous! Gorgeous color! LOVE the ingredients! Should thr beets be cooked? Thanks for the inspo! Def trying it out! 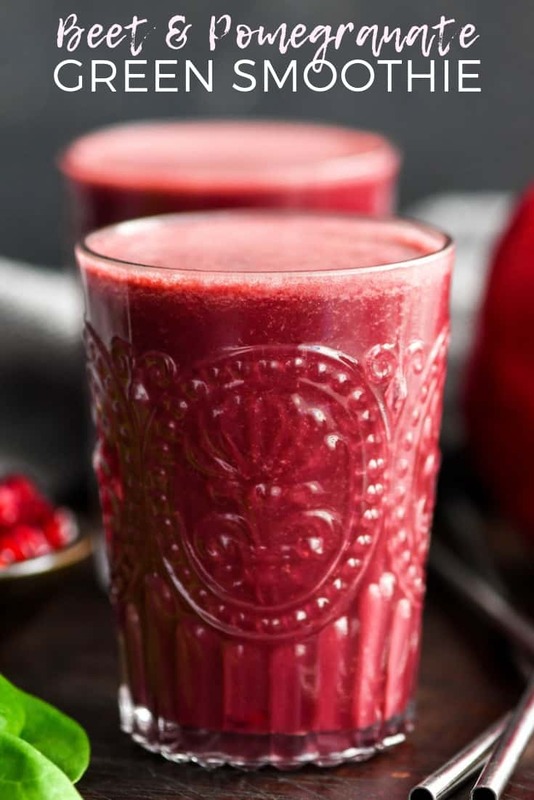 I love beets in smoothies!! The color that they add is magical!! Mmm…. It looks and sounds so good. I love that you put two yummy pink/red fruits/veggies in it; it’s such a brilliant color, and I can imagine that it would taste so delicious. 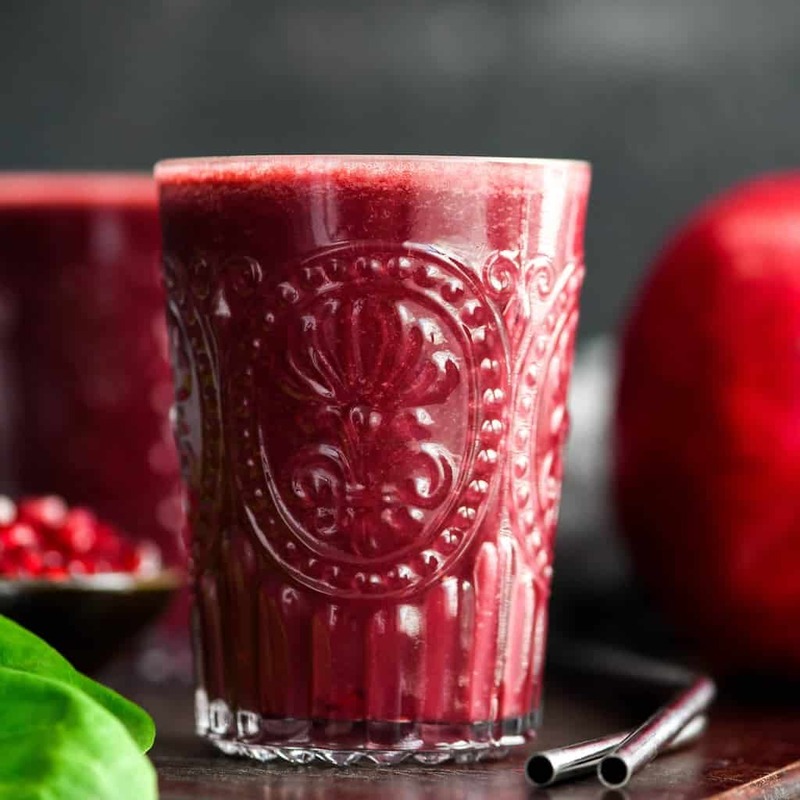 This smoothie is so healthy looking–Pinned! I love the suggestion to give it a festive name so the kids will go for it! Pinning!